The Hometown Strong Team visited the Campus of Broughton Hospital in Burke County to explore with the communities ways to renew the property. Governor Roy Cooper and Department of Natural and Cultural Resources Susi Hamilton speak in Lenoir County. The county is enjoying the growth of the Arts in their communities as well as exploring industrial opportunities. The students of Marshall High School in Madison County welcomed the Governor with school spirit. Department of Environment Secretary Michael Regan and Department of Natural and Cultural Resources Chief Deputy Secretary Reid Wilson take part in the Pasquotank County Round Table. In small communities, when you face a problem, you solve it by bringing everyone around the table. Hometown Strong brings that same spirit to state government and gives rural communities a partner they can count on in Raleigh. Hometown Strong is an initiative that offers a more personal and hands-on approach for state government’s reaction to the needs of North Carolina’s rural communities. Hometown Strong creates a partnership between state agencies and local leaders to champion rural communities. The effort leverages state and local resources, identifies ongoing projects and community needs, and implements focused plans to boost the economy, improve infrastructure and strengthen North Carolina’s hometowns. Use Existing Data and Programs. Using existing resources avoids start-up delay and moves projects rapidly into action. Use Local Priorities. Listening to local leaders about their community needs focuses action in the right areas. Lead with Positives. Every community has strengths to build upon and a desire to prosper while maintaining a unique character. Building on strengths and assets already in place and coming from a positive perspective creates ongoing momentum. Share Templates for Success. State agencies can bring technical assistance and other resources to bear upon local priorities that can complete projects on the cusp, convene a group of decision-makers or begin planning for long-term projects. North Carolina is a rural state, with 80 of our 100 counties being outside major metropolitan areas. Approximately 2.2 million people call rural North Carolina home. Without a doubt, the state’s most beautiful natural resources can be found in rural North Carolina. Sites like Table Rock, Pisgah National Forest, and Lake James attract countless tourists year after year. Rural communities are resilient tight-knit communities that know and look out for each other. They share the joys of a local celebration or a high school sports victory and the pain of a lost employer or natural disaster. Even though rural residents differ vastly in geographic location or demographic makeup, they share one common attribute—they are proud of the places they call home and want to see them thrive. Rural North Carolina isn’t looking for directions from Raleigh—they want state government to listen and help when asked. We will work to break down silos in state government to get the communities the support they need and deserve. 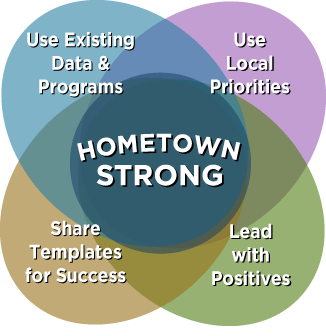 Hometown Strong is working to identify needs and meet local leaders to understand their unique objectives. To begin delivering productive partnerships as soon as possible, Hometown Strong's initial work is focusing on counties that are already engaging with the state on several projects or have local projects in which the state can help bring to fruition. The Department of Administration acts as the business manager for North Carolina state government. The department oversees Government Operations such as building construction, purchasing and contracting for goods and services, managing state vehicles, acquiring and disposing of real property, and operating auxiliary services such as courier mail delivery and the sale of state and federal surplus property. The North Carolina Department of Commerce is the state's lead agency for economic, community, and workforce development. The Department works with local, regional, national, and international organizations to fulfill its mission to improve the economic well-being and quality of life for all North Carolinians. Taking a comprehensive approach to economic development, the department’s work reaches many areas. The department helps people find jobs and employers find and retain a qualified workforce. The department administers the state’s employment security system, supporting workers during career transitions. The department provides local communities with grants and planning services to spur infrastructure development and economic growth, and administers the state’s economic incentive programs. The North Carolina Department of Environmental Quality is the lead stewardship agency for the protection of North Carolina's environmental resources. The Department of Health and Human Services manages the delivery of health- and human-related services for all North Carolinians, especially our state's most vulnerable citizens – children, elderly, disabled, and low-income families. The department works closely with health care professionals, community leaders, and advocacy groups The department works with local, state and federal entities and many other stakeholders to make this happen. The IT professionals at the Department of Information Technology are committed to providing outstanding service to their customers and the North Carolinians they serve. Led by the State Chief Information Officer (SCIO), the department is the leading provider of IT services to state agencies, local governments, and educational institutions across North Carolina. Our services include hosting, networking, telecommunications, and desktop computing and unified communications, including email and calendaring. The department offers 24/7 support through our ITIL®-trained Service Desk and IT Service Support teams. The Department of Military and Veterans Affairs (created in 2015) focuses on protecting North Carolina’s military installations, working with the communities around military bases, helping military families and veterans get the support and services they need, and helping connect veterans with jobs. The N.C. Department of Natural and Cultural Resources is the state agency with a vision to be the leader in using the state's natural and cultural resources to build the social, cultural, educational, and economic future of North Carolina. The department is home to the state’s historic sites, museums, zoo, symphony, parks, aquariums, libraries, archives, and more. DPS employees supervise offenders in prison, in juvenile detention centers, and in community supervision. State troopers enforce North Carolina highway laws and Emergency Management personnel help plan for and recover from man-made or natural disasters. The North Carolina Department of Revenue is a cabinet-level executive agency charged with administering tax laws and collecting taxes on behalf of the people of the State. Its mission is to fund public services benefiting the people in North Carolina, administer the tax laws, and collect the taxes due in an impartial, consistent, and efficient manner. One of state's largest government agencies, the Department of Transportation is responsible for maintaining approximately 80,000 miles of roadways and 18,000 bridges and culverts across North Carolina, as well as regulating and implementing programs to support rail, aviation, ferry, public transit, and bicycle and pedestrian transportation. The department also includes the Governor's Highway Safety Program, N.C. Division of Motor Vehicles, and N.C. Turnpike Authority. The department also oversees the N.C. State Ports Authority and N.C. Global TransPark – both of which help expand economic opportunities in the state. The North Carolina Office of State Budget and Management is tasked with delivering the highest quality statewide budgetary, management, and information services to advise the Governor, state agencies, and the legislature on the most effective use of public resources. The Office of State Human Resources serves as the "Center of Human Resources Collaboration and Facilitation" for the State of North Carolina through an integrated, professional Human Resources function that is collaborative, strategic, and customer-focused, allowing state government to attract, retain, develop, and motivate a high-performing, diverse workforce. In compliance with the State Human Resources Act and with accountability to the Governor and the State Human Resources Commission, OSHR provides high quality human resources services that enable agencies and universities to attract, motivate, develop, and retain a competent, diverse workforce to meet their business objectives.